Ginger Duck in Orange Sauce: Blogmas Day 6: St. Nicholas Day! A father has three daughters for which he needs to provide a dowry for in order for them to get married. The father does not have enough money for them and therefore it is likely that his daughters will be unable to get married. St. Nicholas hears of this and "under the cover of night" he throws a bag of gold into their window each night for three nights. On the third night the father stays awake to see who is providing such a generous gift. 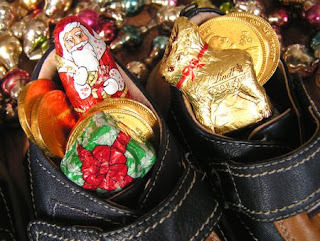 St. Nicholas hears of this and instead throws the last bag of gold down the chimney where the daughters' stockings are hung from being washed. The bag of gold drops into the stocking. There are many variations of the story but this is the one I am most familiar with. I hope you all had a wonderful day and I will see you tomorrow for Blogmas Day 7!